If you are trying to compete in Ninja Warrior, you need a rock-solid grip not only with your hands but also with your feet. Without the right shoe, you may be slipping on obstacles or wasting energy by having to hold your weight mainly with your arms. Your shoes are certainly the most important piece of equipment and can be the biggest downfall on Ninja Warrior obstacles. And once you have experienced one of the best Ninja Warrior shoes, you’ll never want to race without it. When starting with my Ninja Warrior training, I would have never believed that the shoe choice matters that much. But I saw how some people struggled on certain obstacles when wearing common running shoes and others could almost relax. So I tested several shoes, and the results were amazing. Not only I got much higher on the Warped Wall, but also could hold my entire weight on certain obstacles with just my feet. My current recommendation for a great Ninja Warrior shoe with superior grip is the minimalist shoe Merell Vapor Glove V3. This is the shoe I wear for competitions, and I’m absolutely happy with. Click here to see them on Amazon. 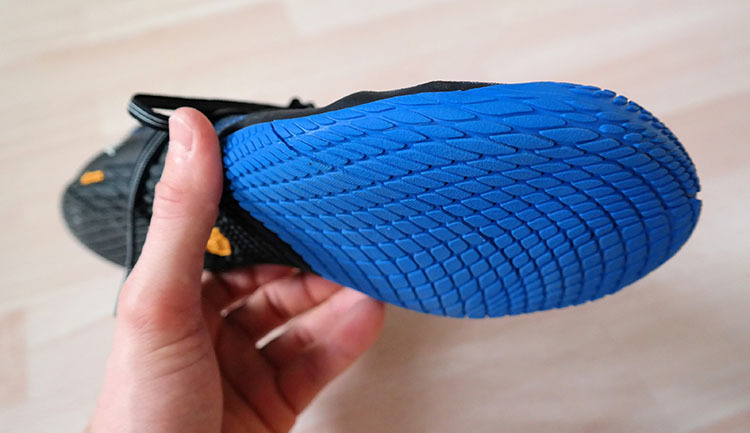 If you want to know what the key ingredients of a great Ninja Warrior shoe are, what awesome alternatives I recommend, like the New Balances Fresh Foam Zante V3, for those who don’t like minimalist training shoes, or why I prefer the Merell Vapor Glove V3 read on. Ninja Warrior and obstacle courses require a lightweight shoe with a large surface area on the sole, high friction and great flexibility, in general. The most favorite brands among the Ninja Warrior community are Merell and New Balance. But more about them in detail later. First, let’s start with the selection criteria. Grip or friction is probably the most decisive attribute when it comes to evaluating a shoe for Ninja Warrior. And you want to have a ton of grip. Rubber soles are currently THE way to get that grip on a variety of different surface. A shoe with a high-quality rubber sole will let you run up walls without slipping and hold your weight on vertical rods or the Hanging Doors without using your hands. Vibram® is one of the favorite rubbers in the Ninja Warrior community. Take a shoe with a Vibram® sole and you know you will have a fantastic grip on any obstacle for a very long time. There are also other rubber soles that show comparable performance. So don’t use it as an exclusion criterion. But stay away from climbing shoes. Their rubber is sticky on rougher surfaces but often fails on smoother surfaces like PVC. The lighter a shoe, the better for Ninja Warrior courses. Your shoes shouldn’t weigh you down. That’s why I love minimalist shoes. Their weight is almost not perceptible. When tackling a balance obstacle with a thick cushioned sole of a traditional running shoe, you certainly get a very poor sense of what’s under your feet. That’s where flat and flexible soles provide a significant advantage. With thin flexible soles, you get immediate feedback of the ground, and your foot muscles can correct your movements way better. If you have never trained with a thin sole, you will certainly need some time to get used to it. Years of wearing cushioned soles have probably weakened your foot muscles. Maybe you even experience sore muscles in the beginning. But your muscles will strengthen over time, preventing you not only from injuries but also providing you a much greater balance, advanced agility, and stability. Besides the sole being flexible, the whole shoe should be flexible enough to bend around obstacles and adjust to the situation, providing you, even more, grip and control. Having a good quality shoe with the right build can make a big difference when it comes to tackling Ninja Warrior obstacles. The shoe should fit tightly but feel comfortable, so you get maximum control and don’t lose them when jumping into obstacles, such as the Cargo Net. Most Ninja Warriors take shoes with half or whole size smaller than their street shoes. I also recommend shoes without high ankle support. They are lighter and provide better flexibility and range of motion which is essential for many balance and agility obstacles in Ninja Warrior. Durability is important, as you surely don’t want to buy new shoes every month after wearing out their sole. And once on the show, you certainly want to have spare shoes with an almost perfect grip. That’s why, in any case, I recommend having a pair of shoes for your training and one for competitions. One part you should certainly look at is the pattern on the sole. It can influence the durability of a shoe drastically. If the pattern is very thin thin and molded of a single piece of rubber, then the pieces will stick there for their lifespan. 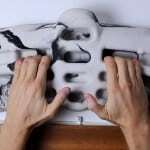 But if those are really chunky pieces, they probably get ripped off at some point which results in a deteriorated grip. 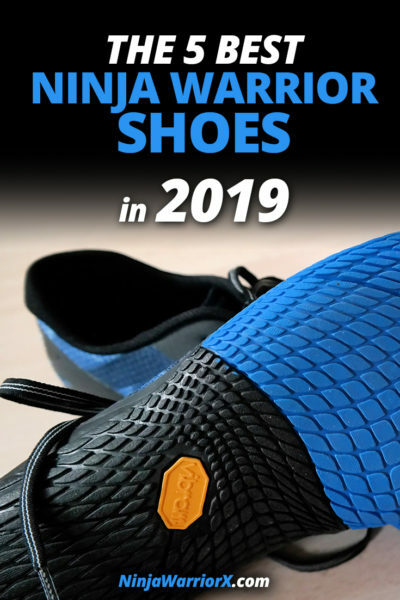 Now, that you know the key ingredients of a great Ninja Warrior shoe, here is a list of the best Ninja Warrior shoes in 2019. If you miss your favorite shoe, please leave a comment below. Thanks, and enjoy! These shoes might be built for outdoor pursuits but are also perfect for Ninja Warrior training on obstacles such as the Spider Jump, Warped Wall, and the Hanging Doors. The Merell Trail Glove 4 is a barefoot shoe that feels almost like a sock and has a tight fit. The sole is thin and made of Vibram® which gives this shoe a fantastic grip and sense of the ground. If you are looking for a versatile Ninja Warrior shoe with which you can also go running and train Parkour, this is surely a great choice. I have even worn it during mud runs. Its durability is outstanding, and I still use it as my training shoe on Ninja Warrior obstacles. Click here for the women’s version. The Merell Vapor Glove 3 has by far the thinnest sole and you will feel every inch under your feet. Like the Merell Trail Glove 4 it is a minimalist barefoot shoe, that’s ultra-flexible, absolutely lightweight and feels like wearing a sock. 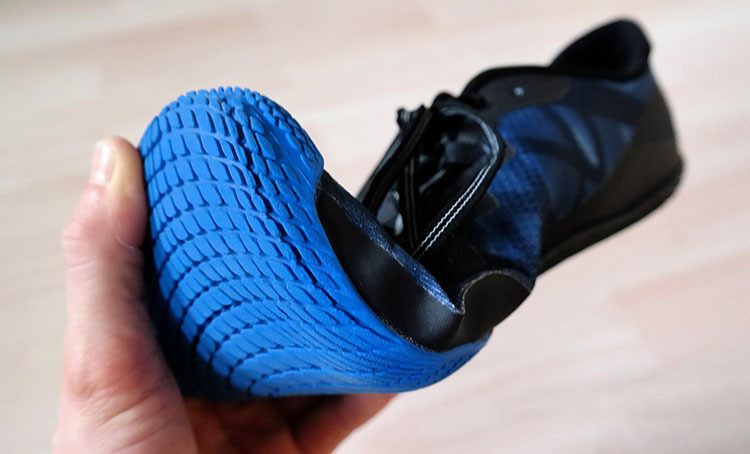 It has a flat Vibram® sole with a honeycomb-like structure that gives you the best grip on every Ninja Warrior obstacle. It’s only downside may be its durability, as some reviewers on Amazon are criticizing it. I wouldn’t recommend this lightweight shoe with its thin sole for trail running, but for Ninja Warrior it’s perfect. I use it as my competition shoe. The New Balance Fresh Foam Zante V3 is one of the favorite Ninja Warrior shoes and worn by many competitors. It has an outstanding grip, almost comparable with the Merell Vapor Glove 3, is highly durable and more comfortable than the minimalist shoes. The quality and the fit of this shoe leave nothing to be desired. Unfortunately, the sole of this shoe is quite stiff and significantly thicker than the Merell soles. This may negatively affect your balance and reduce the grip on rounded obstacles, such as vertical rods or beams, as the sole can poorly adapt to this kind of shape. That’s why I prefer a minimalist shoe. But this is a personal preference. And all the Ninja Warriors that are wearing this shoe can’t be that wrong. The reason I recommend the V3 and not the V4 is that many Ninja Warriors have testified the superior grip of the older V3. The New Balance Minimus 20v7 Trainer is a minimalist shoe with a flat Vibram® sole. The shoe is lightweight – only the Merell Vapor Glove 3 is slightly lighter – and the sole has fantastic friction. As the sole is thinner than the one of the New Balance Fresh Foam Zante V3, you get a better feeling of the ground and improved flexibility. So, this shoe might be a good compromise between sensitivity and impact absorption. But, if you have wide feet, you should try another one. This shoe is quite narrow. Also, some buyers claim that the durability could be better. The New Balance Zante Trainer V1 is another great Ninja Warrior shoe. 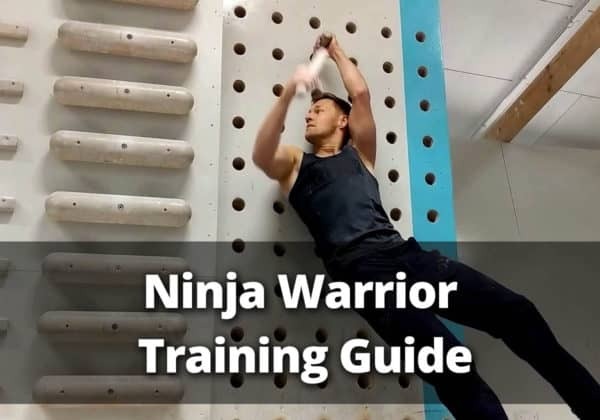 It was released just recently in December 2018 and has been a hot topic in Ninja Warrior forums and Facebook groups since then. It is comparable with the New Balance Fresh Foam Zante V3, but features a more flexible upper structure and some fancy lacing to minimize the amount of sliding around in the shoe. Ninja Warriors who have tested this shoe, claim that the friction is even slightly better compared with the Zante V3. Unfortunately, as they just came out, nothing can be said regarding their durability. The difference between a great Ninja Warrior shoe and a common training shoe is huge! You will never go back, once you had the right shoe on your feet and tackled an obstacle successfully where you struggled with slipping before. If you can handle a pure minimalist shoe and prefer grip over shock absorption and durability, I highly recommend the Merell Vapor Glove 3. If your preferences are different, then a shoe like the New Balance Fresh Foam Zante V3 may be another awesome choice. So, have fun with one of the best Ninja Warrior shoes and let me know of your experiences in the comments below.